Having gained wide popularity at the beginning of the 19th century, the interior of the Empire style represents the ceremonial military triumphal celebration of the imperial style in all its glory. The homeland of this sophisticated style is France, which is still considered the trendsetter of world fashion. Since this was the golden time of Napoleon’s reign, the pompous Empire style in the interior is often called Napoleonic classicism. It has various elements of military heraldry, laurel wreaths of the winner and walls decorated with crossed spears or swords. 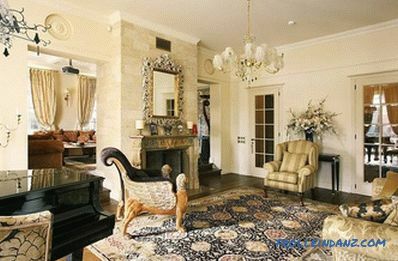 In the imperial house the interior should be worthy of royal persons. Luxury and pathos, glory and military power, superiority and demonstration of greatness - this is what distinguishes the Empire style from others. 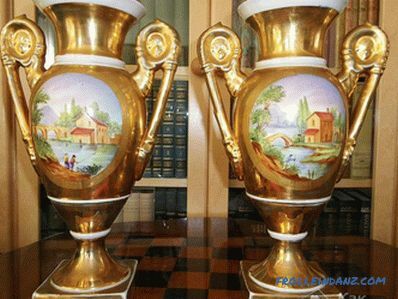 At one time for the Empire style The military campaigns of the French in Africa and Europe had a strong influence; therefore, architectural features and decorative elements of the culture of different countries serenely coexist in it. The basis of this style is neoclassicism, that is, massiveness and monumentality. In addition, the interior is decorated with columns, sphinxes, ornaments and reliefs. 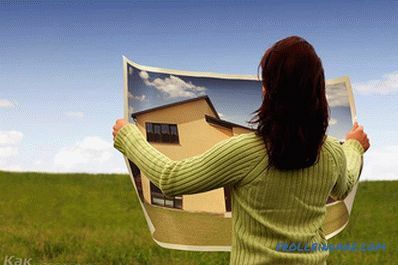 Certainly, the house should have spacious rooms, high windows and ceilings. A strict combination of all design elements with the monumentality of imperial grandeur. In the rich and refined interior there should be a solemn ceremonial (with the obligatory observance of the rules of balance and symmetry). An abundance of ancient Roman, ancient Greek and Egyptian decor elements. The presence of coat of arms and military symbols. 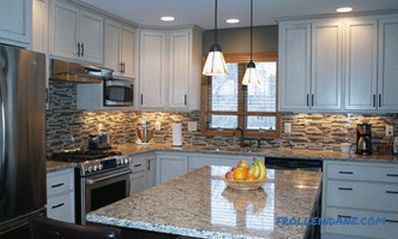 Using a rich color palette when decorating walls, ceiling and floor space. 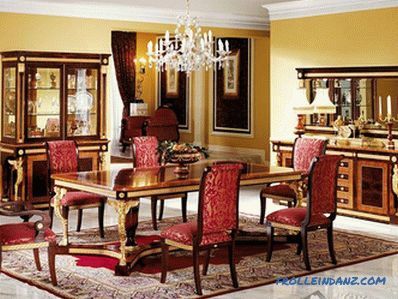 The presence of massive furniture with elegant decor, made of precious wood. The classic decoration of walls is the use of expensive fabrics (silk or brocade), but you can paste over the walls and textured wallpaper, imitating silk fabric, depicting military symbols, African forests or with a strict ornament. 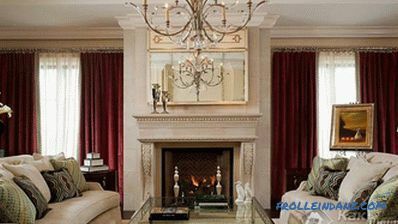 Decorate the walls made of artistic murals, medallions, bas-reliefs, cornices, arches, pilasters and columns. 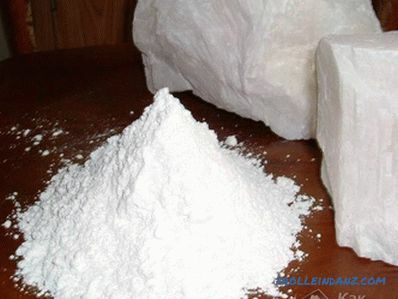 A luxurious crystal should be placed in the center of the ceiling a chandelier, around which the ceiling is decorated with ornate artistic stucco or a beautiful plaster ornament with gilding. 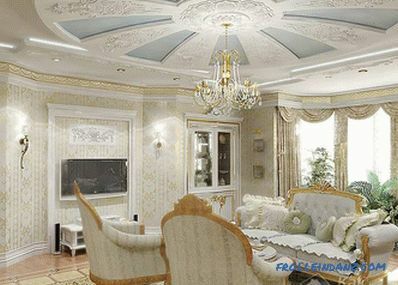 The ceiling is usually painted in ivory or in classic white. The parquet made of valuable wood with a complex pattern will add special refinement to the interior. 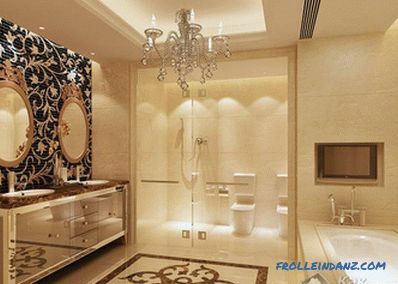 In addition, the floor can be decorated with marble mosaics with Greco-Roman motifs in patterns and artistic images. Windows are decorated as curtains from light silk fabrics, bordered with fringe and tassels of multi-layered velvet drapes. 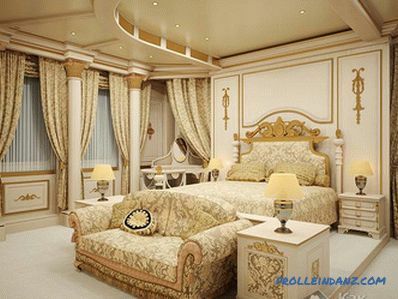 Color curtains should match the imperial shades, such as purple and gold. On the fabric allowed the presence of military symbols and gilded drawings. 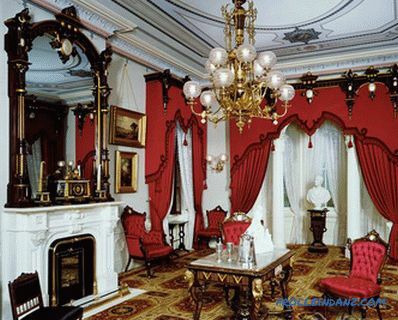 Empire-style rooms are made out in red, blue, blue and white colors. As color accents, as a rule, use gold. 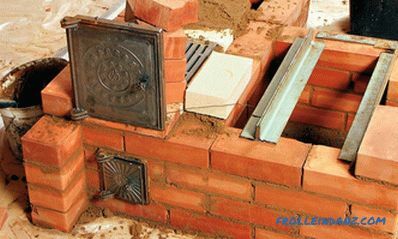 The interior of the Empire style involves the use of expensive natural materials. 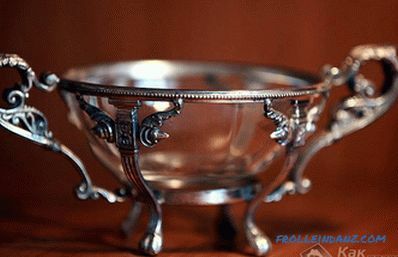 These include wood, marble, crystal, gold, silver, bronze. 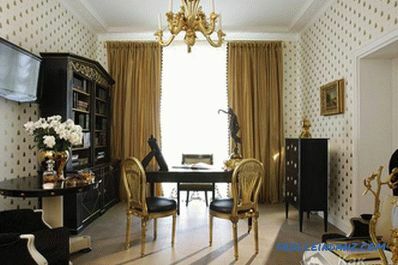 Any Empire style furniture is designed to underline the ambitious pomp interior. 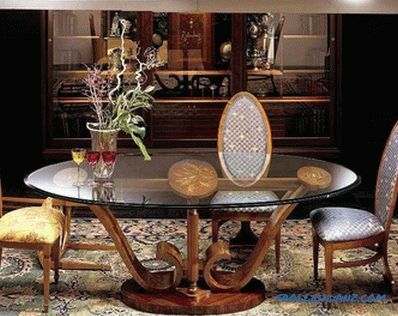 As a rule, it is heavy furniture of massive lapidary mahogany forms with smooth polished wooden surfaces, inlaid with gold leaf and artistic carvings. 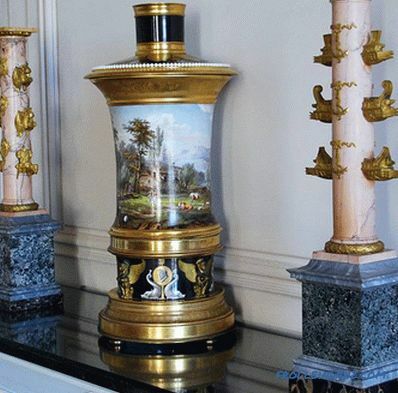 Furniture legs can be made in various styles: in the form of swans, sphinxes, paws of a lion, as well as in the form of Roman columns, pilasters and a symmetrical pattern. 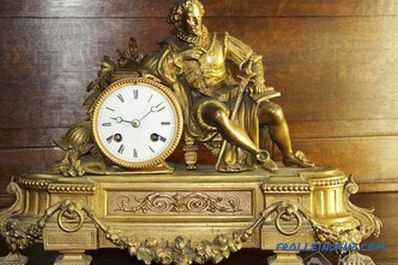 In the best way to such an expensive interior fit antique furniture. 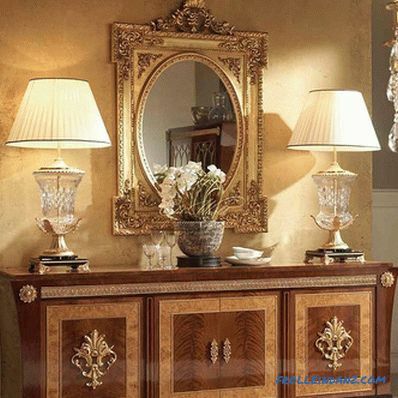 The decoration of any room in the Empire style will undoubtedly be an old chest of drawers, a narrow sideboard or a showcase, a round serving table and, of course, an elegant recamier couch with an elegant curved back. 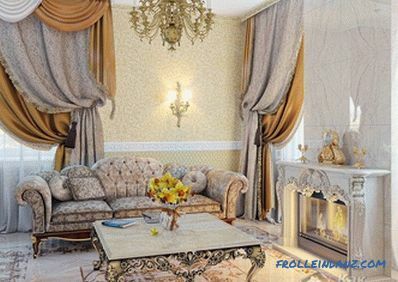 If you carefully think over all the nuances and details, the expensive and respectable Empire style will perfectly fit into the apartment of a modern layout.